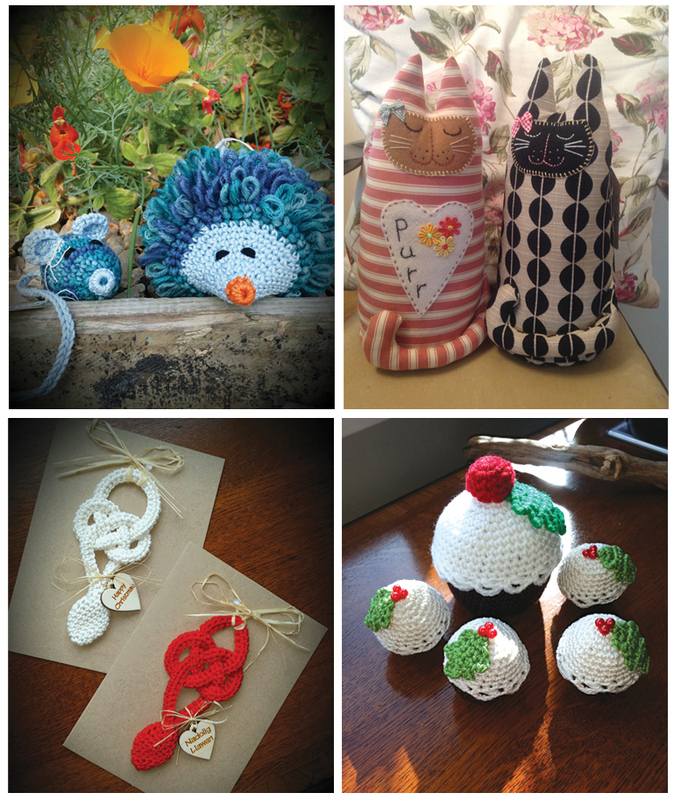 There will be an Artisan Craft (some examples shown in the pictures right) and Food Fair held at the King Arthur, Reynoldston on Sunday 19 November from 11:00 to 16:00. Proceeds will go to the charity Tenovus. FREE Entry. This could be the sport you’ve always wanted to try – now you can – with guaranteed success! No special kit or equipment needed – it will all be provided. There’s no upper age limit as it is suitable from 8 years old. Seniors and students are all welcome. Classes are held at the Seventh Day Adventist Church in Sketty on Monday and Thursday from 19:00 to 21:00 by kind permission of the minister. 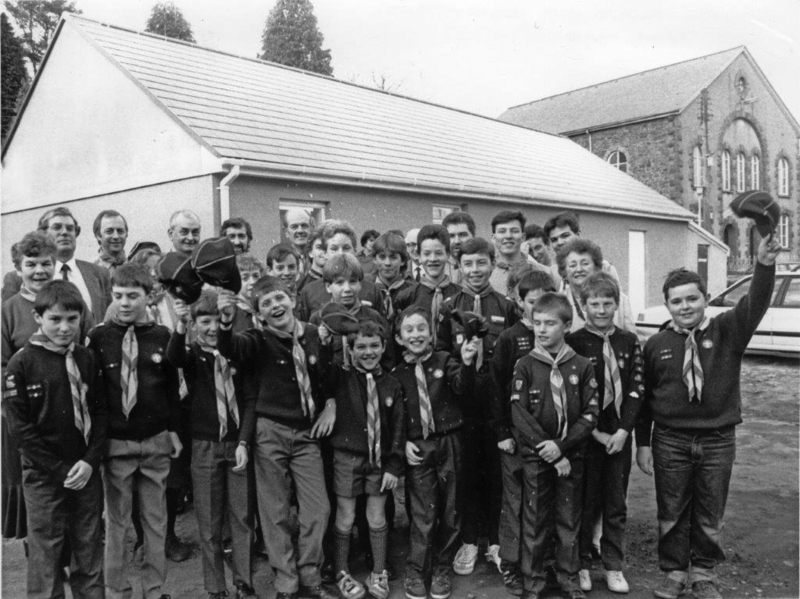 These Cubs and Scouts are celebrating with their leaders and guests after the opening of the newly reno-vated Dunvant Scout Hall, in April 1990. Commemorating an event that took place nearly 30 years ago, this lovely photo-graphic reminder of days gone by is among more than 350 images that fill the 192 pages of the aptly named pictorial nostalgia book from David Roberts, Swansea Echoes of the past. The book is the 20th produced by David in consecutive years and captures some fantastic glimpses of Swansea in the past. For details on how to obtain a copy visit www.bryngoldbooks.com or phone 01639 643961. M&D’s Crazy Craft Fairs will be held at the Ostreme Centre in Mumbles on Saturday 4 November and 2 December from 10:00 to 16:00. Abbey Players are back in the Grand Theatre in November with a Dickens classic’ A Christmas Carol’. It is a musical of the famous novel about Ebeneezer Scrooge, with music by Alan Menken. This year they are celebrating the very special anniversary of accompanist Mr John Davies who has been a central part of the society for 50 years. John, a local Killay boy, joined Abbey in 1967 as Musical Director for the show ‘Where’s Charley?’ in those days performed at the Llewellyn Hall in the YMCA. John was very much a part of bringing Abbey into Swansea Grand Theatre and growing the society into the very professional company that performs today. ‘A Christmas Carol, the Musical’ is at Swansea Grand Theatre November 22-25. Tickets are available from Anne Williams 01792 230007 or the Grand Theatre box office. 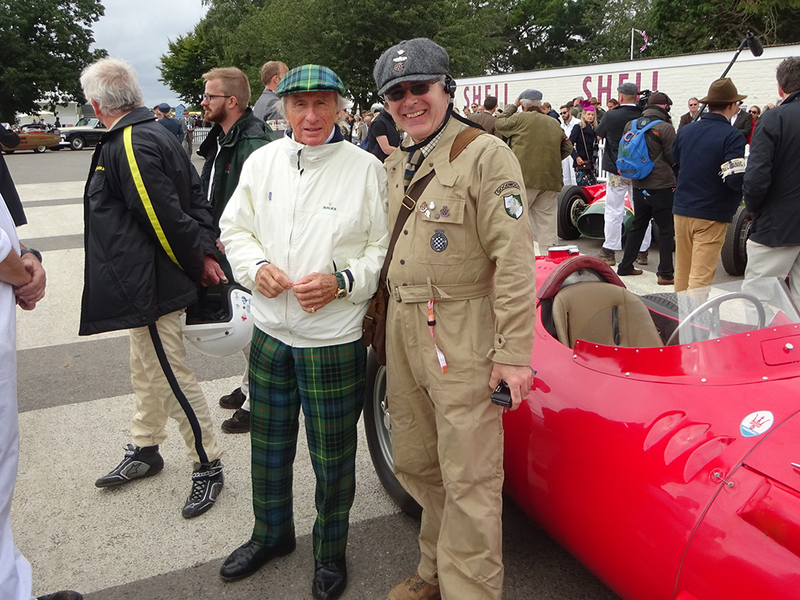 The Bay’s motoring writer Liam Bird was caught on camera rubbing should-ers with the 3 times Formula 1 World Champ-ion Jackie Stewart at this year’s Goodwood Revival meeting in September – hence the clothing; he doesn’t go everywhere in a flat hat and vintage style overalls – although Jackie does like a bit of Tartan even when he isn’t at Goodwood. The car you can see (just about) is the Maserati 250F that Juan Manuel Fangio won the 1957 German Grand Prix in, at the Nurburgring. Fangio was/is Jackie’s hero and Jackie was just about to drive it 60 years after its famous win. The Pontarddulais Male Choir Annual Concert will be held at the Brangwyn Hall, Swansea, on Saturday 25 November at 19:00. Special Guests will be Lesley Garrett, Britain’s best known soprano and the talented instrumentalist Charlie Lovell-Jones. Tickets will be £15 and £10 from any chorister or by ringing 01792874349. The winner of lunch for two at the Cwm Deri Vineyard was Jonathan Tattershall of Pontypool. Companionship is emerging as one of the most important elements for a healthy old age. And locally there’s an organisation that offers something to do every day of the week with like minded people. As a member of Swansea U3A you can play short tennis on Monday, learn a language on Tuesday, go out and about sketching with the drawing group on Wednesday, enjoy a yoga class on Thursday and get help with researching family history on Friday. That is just a small selection on what is on offer with Swansea University of the Third Age. A subscription of only £10 gives you access to over 100 interest and study groups plus exercise groups for all taste and abilities plus the chance to make new friends at regular social events and day trips. You won’t need any qualifications to join and you won’t be required to take any tests. Members attend groups and lead groups so there’s no limit to the subjects that can be covered. Bay Health Cluster Network is working with the local community to increase activities for older adults. They currently have two initiatives running for patients in the Bay Health area. Are you aged 55 and over and looking for ways to improve your physical mobility and wellbeing? A new weekly Balanced Lives class has launched in Sketty for older adults, offering free support to build strength and become more active. have a long-term health condition. have recently experienced a fall. are seeking to improve your balance. are experiencing a loss of confidence in your physical abilities. feeling low, and want to improve your mental wellbeing. Run by the charity Action for Elders in partnership with the Bay Health GP Cluster Network, the classes are completely free. Group participants tell us the classes are friendly and supportive, and are a great way to get to know other people in the local area. Led by an expert in physical mobility, you’ll receive a personalised initial assess-ment and an action plan with safe exercises you can practise at home. The classes are held in Hazel Court, Sketty, every Thursday at 2pm. To have an informal chat about whether the classes are right for you, or to book your place, please contact your local GP surgery, or contact the charity directly on either 030 330 30132 or info@actionforelders.org.uk. In addition Helen Hunter from the Red Cafe is offering two interest groups one based in Scurlage, Gower, the other in the West Cross community centre. The interest groups are for all patients whether you have an interest to share, want to learn something new or even just to have a chat over a cuppa. Helen can tailor the session to the groups needs with contributions from outside speakers if required. Helen is more than happy to give you a ring to discuss your situation and get you joining in with the fun! Contact Helen Hunter on 01792 362122 or Helen@theredcafe.org.uk. Or please speak to your GP surgery for information on either of these excellent programmes. 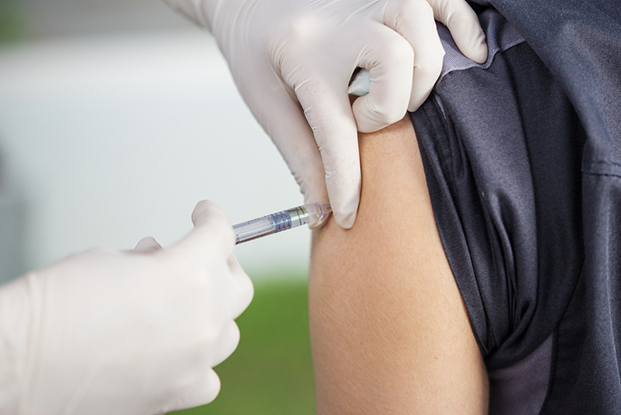 Flu jabs are now available at your GP surgeries. Patients with chronic medical conditions including heart, chest problems, asthma, kidney or liver disease, diabetes, stroke or spleen problems. Those living in a nursing or residential home. Speak to your practice nurse who can advise you if you are unsure. Don’t forget children can be protect-ed too. There’s a nasal vaccine! Contact your surgery to get booked in!! The residents of Tycoch now have their own defibrillator thanks to an anonymous donor. The defibrillator is located at the Co-op supermarket on the corner of Carnglas Road and Harlech Crescent. Bay understands that the donation was made in thanks for treatment that the benefactor received from the NHS, and this was their way of showing their appreciation.